One of Iowa’s best-known artists will be honored through a different form of art next month. 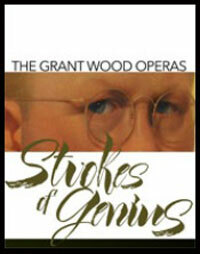 Three Iowa composers were commissioned to write one-act operas based on the paintings of Grant Wood. Virginia Michalicek, interim general director of Cedar Rapids Opera Theatre, says the first operetta was created by Cedar Rapids native Robert Lindsey-Nassif. Charles lives in Iowa City and Ching is from Ames. The idea of producing operas celebrating Grant Wood was first hatched a decade ago, while the composers were commissioned a year ago to create their works, so it’s been a long time coming. Michalicek says folks who are new to opera may fear a language barrier, but that shouldn’t be a concern. Whether it’s a new opera or one that’s 300 years old, and whether it’s Italian, German, French, Russian or American, Michalicek says they all have something in common.